The Chaminade Robert C. Wright Speech and Debate team is off to a fantastic start this year. Anxiously awaiting the difficult invitational tournaments that come during the winter months, the team has been practicing nearly every day. The first of these larger and more difficult tournaments every year is the 2016 Interleague Speech tournament, hosted this year by Kellenberg Memorial High School. Filled to the brim with tough competition, the Chaminade Speech team spent many hours preparing for this trying tournament. The team attempted to broadly assert its dominance, competing in several events, ranging from Extemporaneous Speaking to Student Congress. After numerous hours of preparation, the team was ready to deliver on Saturday, November 12. They battled against some of New York City’s and Long Island’s best teams, facing off with many rivals with whom they will be speaking and debating toe-to-toe for the rest of the year. Throughout the day, the team members did their best to emerge victorious from the tournament. Many speakers walked away from the 2016 Interleague with plenty of trophies this year! After several rounds of competing, the participants who had advanced to the final round were announced. Upon reaching finals, members of the team meet were competing against the best speakers New York City and Long Island have to offer. The competition became very difficult, but the team had faith they would prevail. After giving their final speeches, the team anxiously awaited for awards to start. By the conclusion of the ceremony, it was clear that Chaminade had done very well. Many students placed highly in their events. 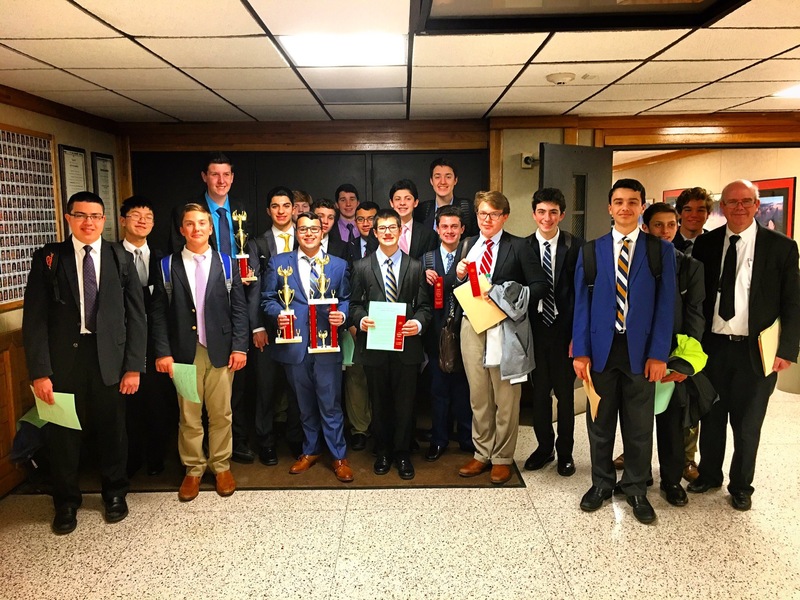 This included John Michael Magloire ’18 in fourth place, Thomas Flatley ’18 in eighth place, and Jack Valentino ‘18 in 14th place in varsity Extemporaneous Speaking. JV Extemporaneous Speaking had a strong finish as well with Shane McCabe ’20 in ninth place, Christian Borruso ’19 in 11th place, and Josef Schindler ’20 in 14th place. These speakers did a fantastic job against a large field of tough competition. Other great performances included Patrick McKenna ’18 in sixth place in Dramatic Interpretation and Robert Delmond ’18 in third place in Original Oratory. The team’s strongest showing was in student congress, in which Chaminade achieved fourth place overall. Individual performances included Chris Boccia ’17 in 10th place and Rory Mahon ’18 in 13th place. Speech and Debate President John Michael Magloire ’18 walked away from the tournament satisfied, feeling that “the speech team was very successful at the annual Interleague Tournament this weekend. The team placed in nearly every event with many finalists in extemporaneous speaking and congress.” Overall the Chaminade Speech team did very well at the 2016 Interleague, setting the tone for a successful year to come.